Day Three begins with a walk from the center of Jerusalem to the Old City. Our expert tour guide, Josh Even Chen, points out sites of historical, cultural and religious significance. Beduin woman tends her flock, as people in this region have done for thousands of years. This olive tree in the garden of Gethsemane is about 2,000 years old. Outside of the many churches we saw. Some of the participants are devout Christians, others are just interested in the history. A few of the many soldiers we ran into during the day. The Cardo dates back to Roman times, 1800 years ago. After many hours of walking the gang enjoyed a good meal of shwarma, humous, and pita. As we approach the area where the Holy Temple once stood (Currently occupied by the Dome of the Rock), Josh teaches us about the original dimensions of the Temple in Jerusalem. Walking to the area of the Temple, a young woman is actually armed security (of which there are many in this area). 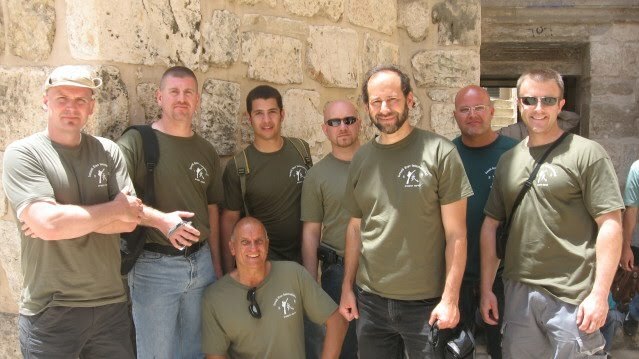 Our guys met and spoke with members of the Yasam, one of Israel's top police units. Craig Gray from Michigan with some local soldiers. After many hours of walking and touring Jerusalem we board taxis and headed out to Yad VaShem, the memorial to our people who were murdered by the Nazis and their helpers in World War Two. 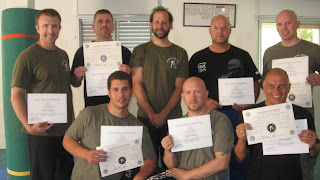 Our expert guide Josh explained that as Krav Maga instructors who want to understand modern Israel and Krav Maga, we must visit Yad Va Shem, because it is here where it all begins, here you find the answers. We began by visiting a few of the 6,000 trees planted to honor the Rightious among the Nations; non-Jews who risked their own lives and saved Jews during this "darkest period in our history". Josh pointed out that this is both a "Thank you" but also a slap in the face to the people of the world. "How can you say 'there was nothing we could do!' for here you see the names of those who had a different attitude and who did save their fellow human beings. Josh at the forest for the Rightious among the Nations. What we saw inside cannot be described, just as what the Holocaust survivors experienced cannot be explained. Chilling, horryfying, shocking, gastly, are a few words that come to mind, but none do justice. Our guests leanred a little of what our people went through, and how little the nations of the world, including the United States, did to help. We could not take photographs inside the memorial but I am sure a great deal is available on line. As we walked out of the memorial, back into the living, thriving Israel of today, Josh discussed with us the evolution of the Israeli people and the changed attitude towards Holocaust, Shoah, victims and survivors. Josh discusses with us the monument to the Jewish resistance fighters and the Holocaust survivors. 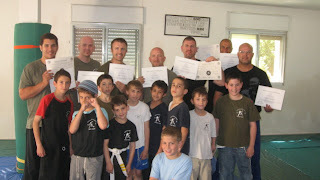 This is where Modern Krav Maga and Israeli fierceness takes a new form. Our instructors will truly go home changed people with a deeper, more profound, understanding of Israel, the Jewish people and Krav Maga.